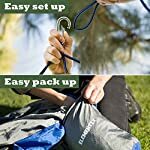 EASY SET UP: Comes with ropes, metal carabiner hooks already attached to the ends of the hammock, and set up instructions — everything you need for quick and easy tree hanging. 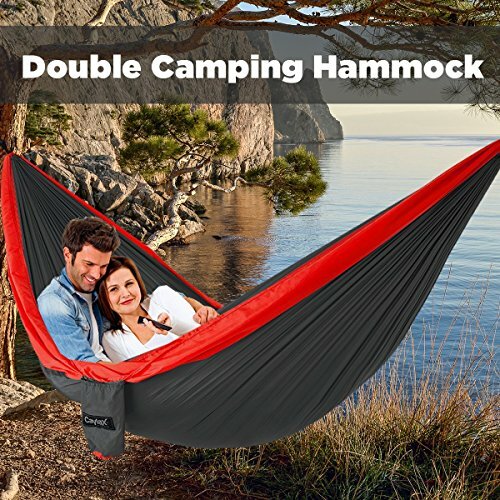 Use it when camping, traveling, and sleeping at the beach, in your backyard, patio, and more. 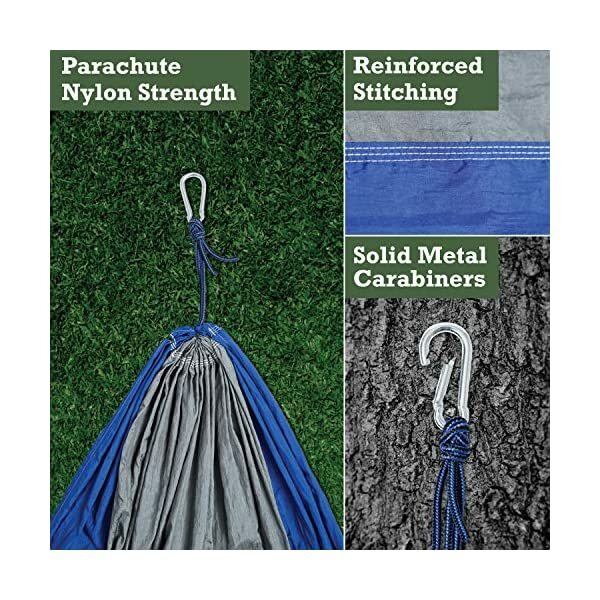 EASY MAINTENANCE: Soft and comfortable nylon fabric material is easy to clean and dries quickly, so you’re ready anytime, anywhere. 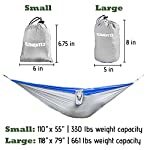 PORTABLE: The attached carrying pouch is easy to take along when backpacking, and makes assembly and disassembly a snap. 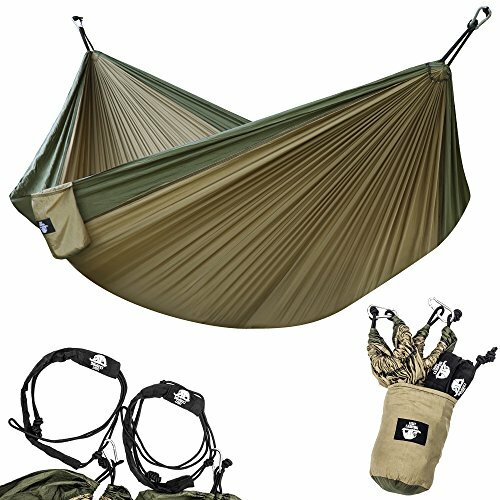 It also doubles as a convenient storage pocket while hanging out. 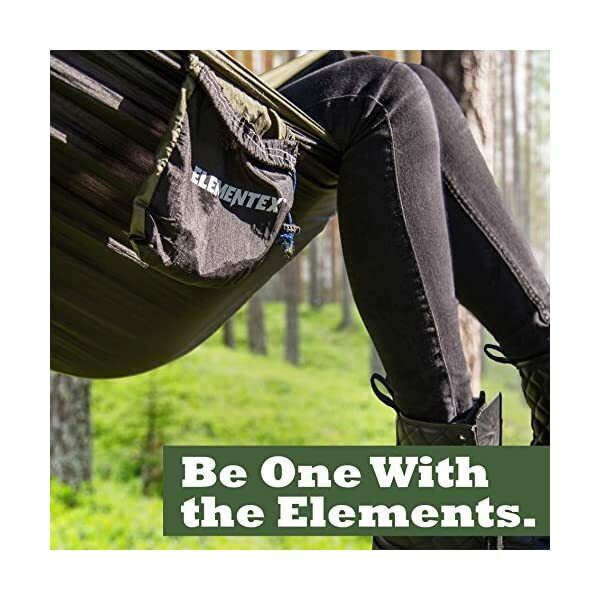 Your ELEMENTEX Portable Nylon Hammock comes standard with a 1-year limited manufacturer’s warranty from the date of purchase which covers manufacturing and material defects. 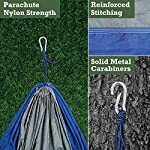 If you received a product with a defect, we will gladly replace your product within a year of purchase, so long as it was purchased from one of our authorized sellers on Amazon. You’re out hiking when you stop in your tracks. You’ve found that perfect spot to kick back. 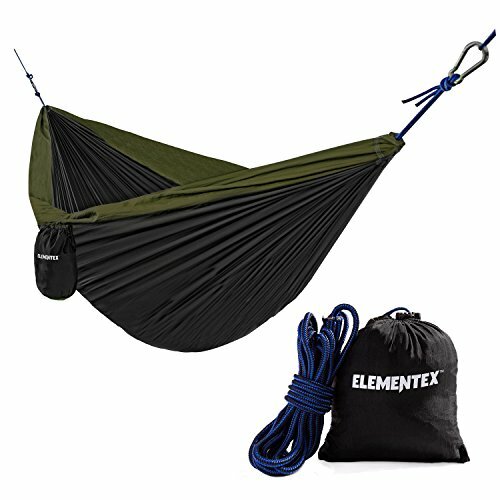 With the ELEMENTEX Hammock that easily fits into your backpack, you’ll be able to set up anywhere you like. Our hammocks are parachute nylon strength, high weight capacity yet lightweight, and perfect for immersing yourself in nature. 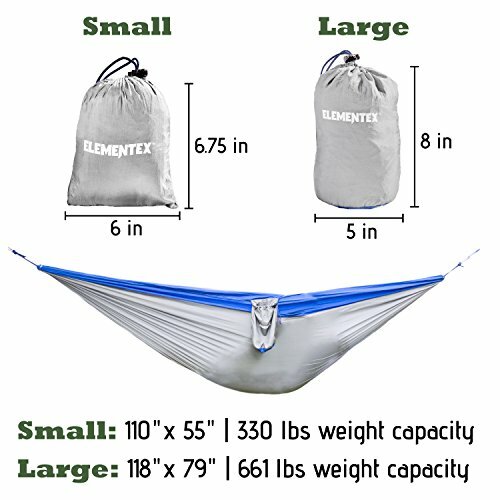 Here at ELEMENTEX, we are all about the Experience – really losing oneself in nature and being one with the elements. 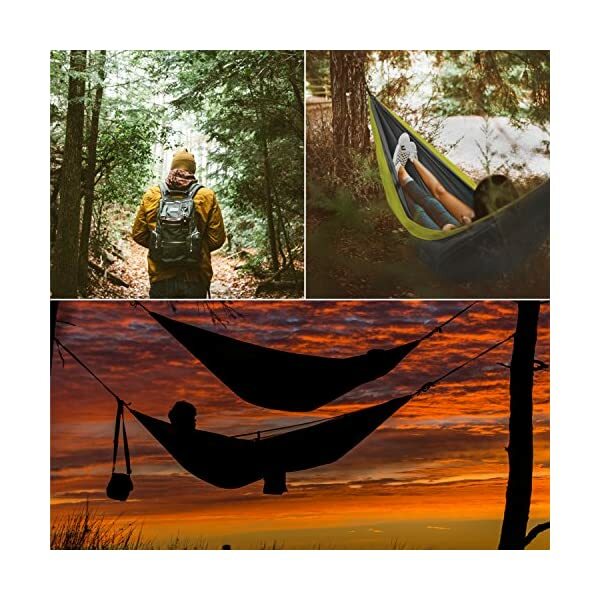 When you are hiking through lush green forests, conquering frosty alpine peaks, or kayaking down roaring rapid rivers, you wish to have gear that is built tough to take on any trail or unchartered terrain, and able to resist a wide variety of weather, fair or fickle. 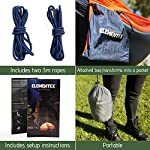 To maximize your experiences and to help you create the most memorable adventures, ELEMENTEX delivers Excellence: High-performance clothing, gear and accessories that are made to tackle every excursion, camping travel, recreational sport, or any outdoor activity in your active lifestyle. ELEMENTEX is as enthusiastic as you are about being outdoors, so we fuel that energy into every product we make, but we don’t stop there. 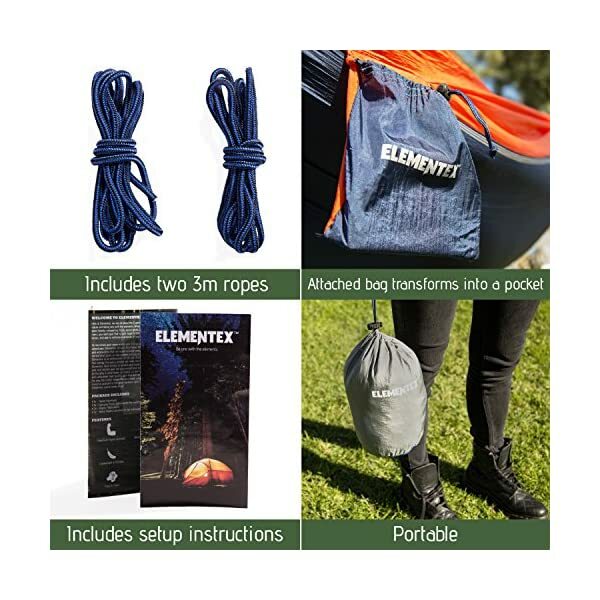 The ELEMENTEX Team strives to exceed your expectations by providing not only secure and reliable gear, but also exceptional customer service and care. 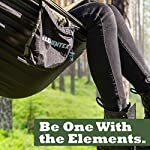 This philosophy is what keeps us rooted, as well as dedicated to providing you with affordable high-quality gear that will be there for you every step of the way. No matter where the road takes you. 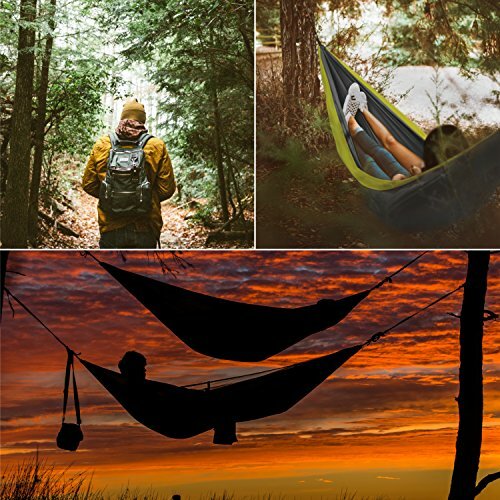 Escape into nature and really immerse yourself in the great outdoors with ELEMENTEX at your side. With ELEMENTEX, you’re ready to go. 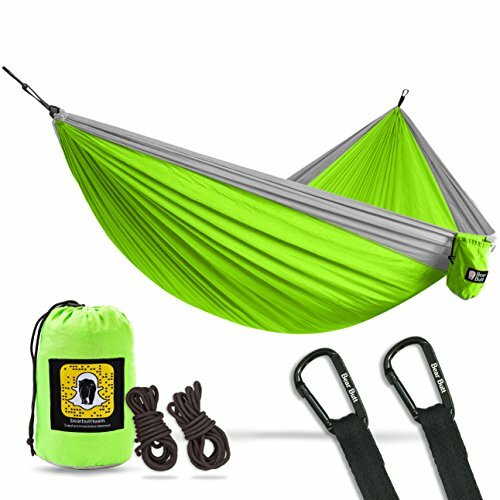 EASY SET UP: Comes with ropes, metal carabiner hooks already attached to the ends of the hammock, and set up instructions — everything you wish to have for quick and easy tree hanging. 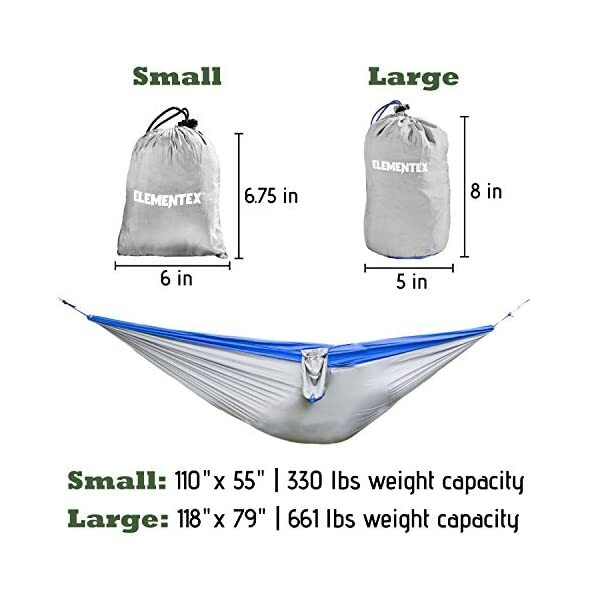 Use it when camping, traveling, and sleeping at the beach, in your backyard, patio, and more. 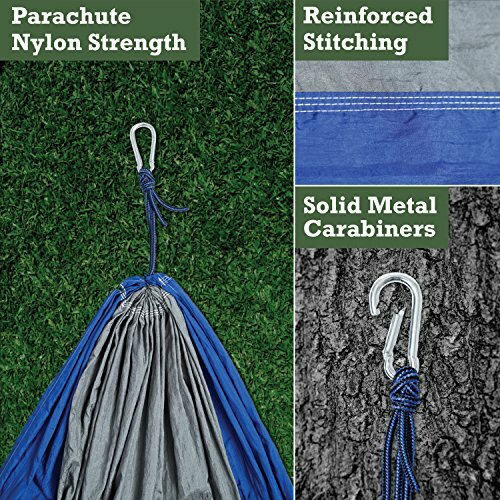 EASY MAINTENANCE: Soft and comfortable nylon fabric material is easy to clean and dries quickly, so you’re ready anytime, anywhere. 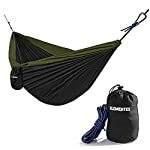 PORTABLE: The attached carrying pouch is easy to take along when backpacking, and makes assembly and disassembly a snap. 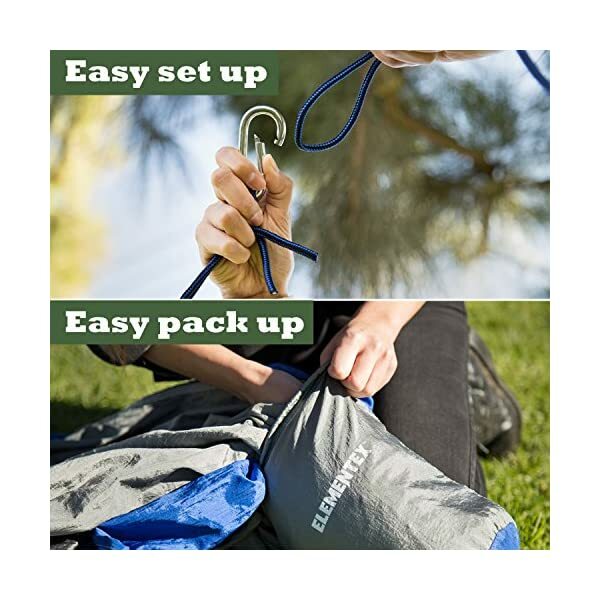 It also doubles as a convenient storage pocket even as hanging out. 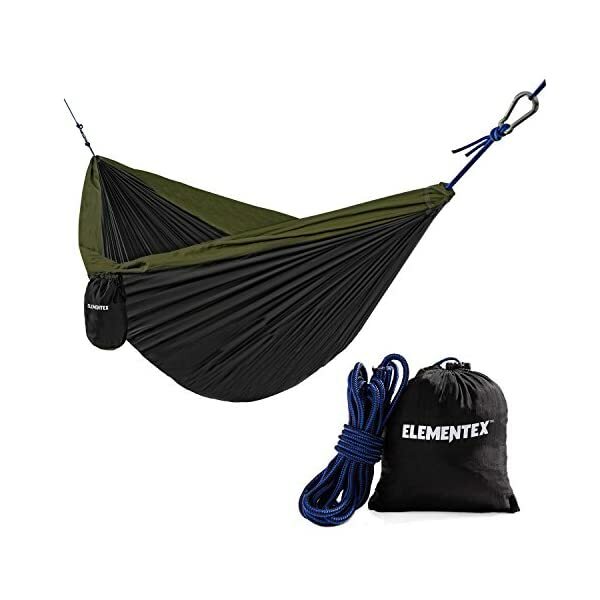 Your ELEMENTEX Portable Nylon Hammock comes standard with a 1-year limited manufacturer’s warranty from the date of purchase which covers manufacturing and material defects. 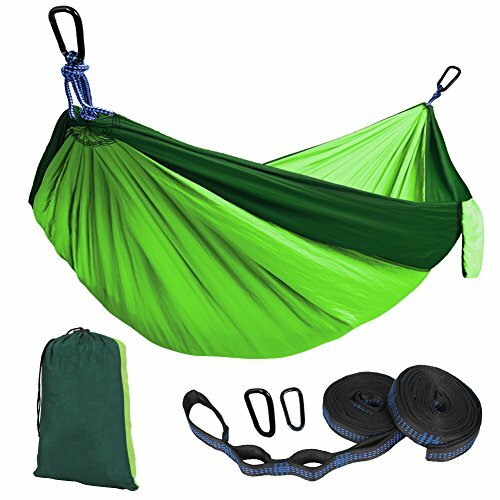 If you received a product with a defect, we will be able to gladly replace your product within a year of purchase, as long as it was purchased from one of our authorized sellers on Amazon.